Come See Us At the Chicago Mini Maker Faire This Weekend! 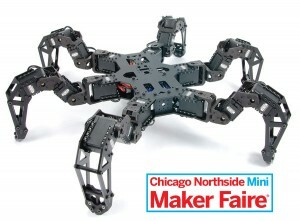 This Saturday, May 2nd we’ll be at the Chicago Northside Mini Maker Faire! The faire runs from 10am-4pm and will be filled with amazing and creative projects from the Chicagoland area, and beyond! We’ll be demoing some of our crawlers like the PhantomX Quadruped and Hexapod. As well as some of our other robots, including the new HR-OS1. So whether you want to try out our crawlers or just chat about robotics, stop on by for a great time.